Abbot Octavian with archbishop Norbert Mtega on the day of deaconate ordination. On the 23rd of January 2016 the monks of Hanga Abbey gathered to elect a new abbot. The lot fell on Fr. Octavian Thomas Masingo, OSB, to be the third abbot of Hanga Abbey. A native of Dung'unyi parish in Singida, northern Tanzania, Abbot elect Masingo was born on 27 April 1975, and made his first monastic vows at Hanga Abbey in July 2003. 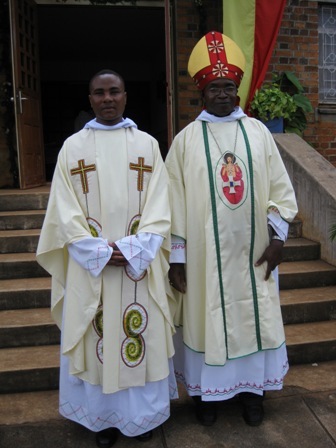 He was ordained on 17 June 2010 after completing his studies in philosophy and theology at Peramiho Major Seminary in the archdiocese of Songea in southern Tanzania. Abbot Octavian has earned a Bachelor Degree in administration from Catholic University of St. Augustine in Mwanza in 2013. At the time of election abbot elect Octavian had been in studies for his Masters Degree in administration which he will complete in July, 2016. Abbot elect Octavian will assume leadership office as abbot of Hanga on the 1st August, 2016 after completing his studies. He takes charge of the abbey from the retired abbot Thadei Mhagama, OSB who led the abbey from 2004 to 2015. And abbot Thadei was preceded by abbot Alcuin Nyirenda, OSB, who reigned from 1994 to 2004. Meanwhile the abbey is under the supervision of prior Jerome Mlelwa, OSB. We thank God for sending us the new leader and we pray for abbot elect Octavian that the good Lord my sustain him in his leadership.